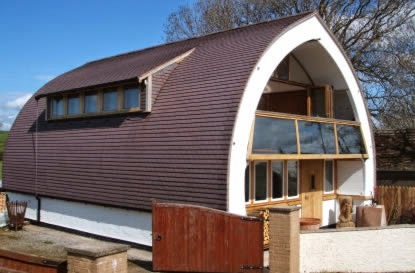 I really like this new straw bale home design by Brian Waite. Its not very often you see a completely new home design that is energy efficient, sustainable, AND well suited to being built by the home owner, but this one is all of the above. The design uses a number of identical prebuilt arches for the main structure of the house. 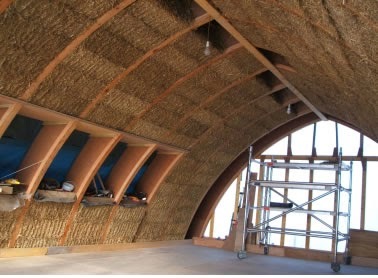 The arches are spaced one straw bale apart so that the bales can be stacked between the arches with no trimming. The arches are light enough to be erected by one person with the aid of a hand winch. In fact, the entire house was built by Brain with only common tools. Straw bales install snugly between arches. The straw bales are stacked from the floor up to the peak in one continuous stack. 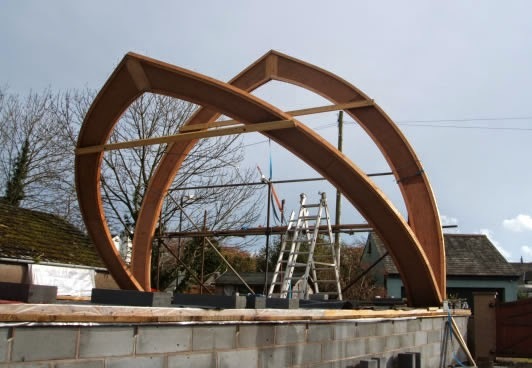 Because the arches provide all of the structural support for the roof, all of the interior walls (if used) are non-structural and would be easy to move over time. 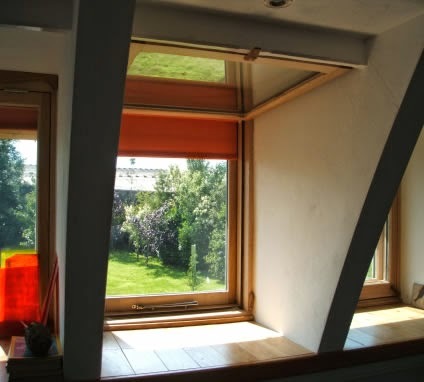 The house has a number of other unique features, including a means to secure the straw bales without settling, and a passive vent system that keeps the straw bales dry. Another unique feature that Brain is testing is a quad glazed window design that is made from two standard double glazed glass units. Quad glazed window made from two standard double glazed units. It seems to me that this is a simple design that is well suited to owner builders while offering an R value up toward US 6. I want to thank Doug alerting me to this fine new design. Love the design of the house. But for me, the most interesting part about it is the process of construction. Love the house. Great unique design.